Brexit, Knife Crime, Persecution, Terrorist Attacks, Crime, Illness, We are facing many challenges locally and nationally and we as a Church are joining together for a special event to pray. You are invited to drop in and join with us, anytime from 10 to 12 noon on Saturday 13 April 2019. We have been challenged to pray more and listen to what God is telling us to do. Make a difference….. pray. 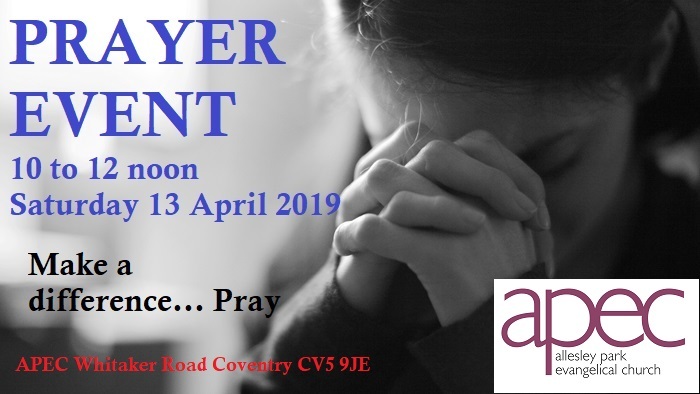 If you have any prayer needs, please email contact@apec-coventry.org.uk and we will pray for you.